PUEBLA — A decade has passed since passenger service ground to a halt on Mexico’s railroads. However, the romance of train travel lives on at the Museo Nacional de los Ferrocarriles (MFNM) or National Railway Museum in the city of Puebla. 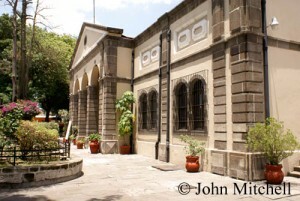 This important museum is located on the site of Puebla’s old railway station that was built in 1869. The neoclassical style main building (currently closed for renovations) houses an extensive collection of railroad memorabilia as well as a research center. But the museum’s main draw is its sprawling rail yard, which is crammed with rolling stock of all kinds. Parked in neat rows are diesel, electric and steam locomotives along with passenger and freight cars, plus assorted machinery from all over Mexico. Some of the carriages have been refurbished and left open for inspection. There are sleeper and club cars, cabooses, and even a fully equipped mail carriage that was used until the 1990’s. One car has been turned into a gallery that displays historical black and white photos. Now that the government-owned railway system Ferrocarriles Nacionales de Mexico (FNM) has been privatized, the only intercity passenger trains still running are privately owned tourist lines such as the Chihuahua al Pacifio that winds through the Copper Canyon in the state of Chihuahua, and the Tequila Express in Jalisco. With train travel all but a thing of the past in Mexico, the tranquil National Railway Museum is an ideal spot in which to while away an hour or two indulging in some nostalgia and experiencing what remains of a bygone era. The Museo Nacional de los Ferrocarriles Mexicanos is located at Calle 11 Norte 1005, a short taxi ride northwest of Puebla’s main square. Admission is about US$1.00. Opening hours are Tuesday through Sunday (closed on Mondays) from 10 am to 6 pm. Move the cursor over the screen of the slide show below to view captions. Click on static images to view larger photos and information about ordering prints or licensing.